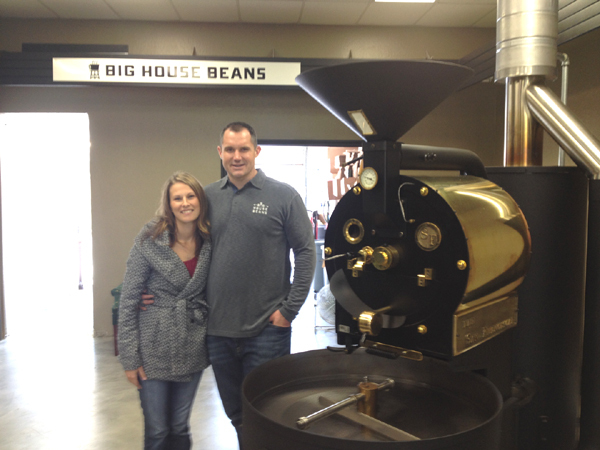 John and LeeAnn Krause with the San Franciscan Roaster at their Antioch location. If you want your favorite coffee fresh from the country where it’s grown, then Big House Beans is your place to buy it roasted. Whether they’re from El Salvador, Guatemala, Columbia, Indonesia or Ethiopia, your favorite roasted coffee beans can be found in the Big House. “As a former San Quentin Prison inmate, John Krause knows of the challenges life can throw at you. Once completely hopeless and in despair, John has since had a spiritual experience. Submission to a power greater than himself has restored John Krause’s life, providing him with renewed purpose. Today his mission is to provide opportunities for others by creating jobs for ex-offenders, raising money for their job training, and supporting rehabilitation programs. Providing customers with great coffee makes for an incredible bonus! Big House Beans is a roastery, which features a large, San Franciscan Roaster that can handle 25 pounds of coffee beans at a time. Plus, they offer wholesale and an online e-commerce site. You can subscribe and have whatever amount of coffee that feeds your habit shipped directly to your home, as often as every two weeks. Located at 1925 Verne Roberts Circle, where the road curves next to Costco, the retail store offers large and small bags of roasted beans, coffee gear, clothing and they offer chocolate covered coffee beans, too. John is already working on fulfilling his mission. “A percentage of the profits will go into rehab,” John said. The current project is to restore the Soma House in Concord, which is a men’s rehabilitation home. The store also features art and 20% of the sale of it goes to the woodshop at the Byron Boys Ranch. For employee, Juan Valdez – yes, that’s his real name – working there is a dream come true. For “coffee at an affordable price, from roasting, to grinding, to serving or sampling, customers get great quality,” he added. To learn more about John and his new business, stop by Big House Beans and see John and Juan, call 1-844-244-2326 or you may email him at john@bighousebeansc.om. You can also visit their website at www.bighousebeans.com, on Facebook or Instagram. (Be sure to see their ad on the Ads & Coupons page of this website). This entry was posted on Sunday, January 11th, 2015 at 11:20 pm and is filed under Business. You can follow any responses to this entry through the RSS 2.0 feed. You can leave a response, or trackback from your own site. Great article! How do we submit ideas for a future article. Thanks. Thank you, Brian and thank you for reading the Herald. Feel free to email information about your ideas for future articles to editor@antiochherald.com.